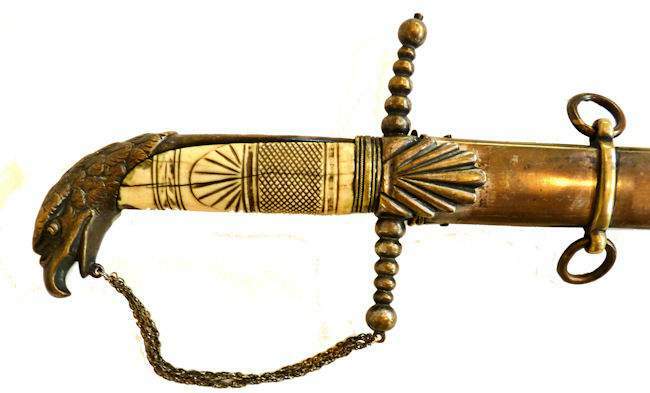 To view our current inventory of rare antique Military, Civil War and Navy swords and weapons, click here! This Elegant Sword Has Been Sold. 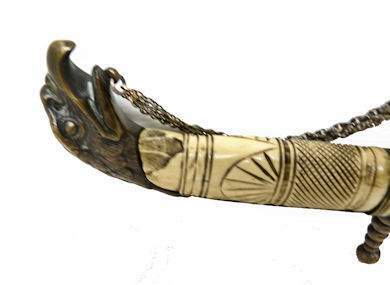 Presented is a very rare eagle head saber made for the American Market with a magnificent pipe back, slightly curved, engraved blade finished in fire blue niter and gilt with a signature style carved bone grip. 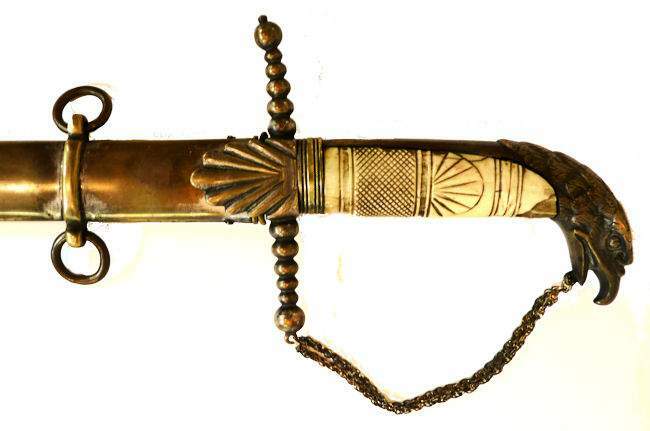 The hilt and backstrap are made in brass covered with a silver wash of which only a little remains. The sword has a cross guard of six diminishing size balls on each side with two strands of silver chain extending from the lower guard to the eagle head. It mates to a fancy ferrule. 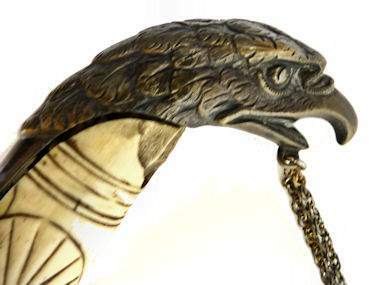 The pommel is fitted with a rare “Open Beak“ eagle in sharp detail with the tang coming through the top of the head that flows directly into the backstrap. The scallop shell shaped langet is sculpted on both sides. DIMENSIONS: Length of blade 31 1/4" Width 1” Thickness 3/8" Length overall 37"
THE BLADE AND HILT: The 31 inch sword is unmarked, but the carved grip is typical of some of the rarest swords imported by A.W. Spies and is believed to be one of the weapons that he brought to the U.S. when he arrived in 1821. Because of the quality of the fire niter gilt blade, we think it might date slightly earlier since after 1820-30 acid etched white blades began coming into favor. 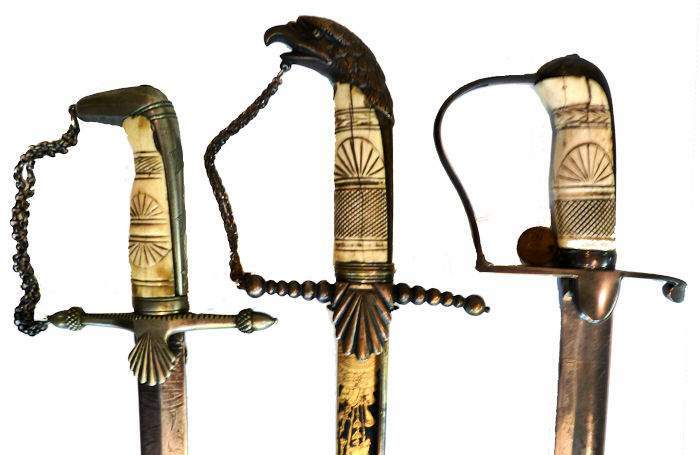 The following images are to show the similarity of the carved grip with the signature scallop shell which is exactly the same for the bottom two swords and a close similarity on the one on top which is marked A.W. Spies in a band on the obverse. The top and bottom swords were purchased by Norman Flayderman from Phillip Medicus in 1956 and later sold to a museum from whom they were acquired. Their provenance cards were removed for the pictures. A twin to the sword on the left is prominently listed in Peterson's, page 79, “The American Sword“. On the obverse ricasso, the blade features two kettle drums, cannon barrel, shield, cannon barrel; then trumpet and two sided pike with branch above, then gold gilt on niter blue. Then section of acid etched nickel branch of oak leafs. Then American eagle with shield, arrows in right claw. Fig leafs to left. Over the eagle is a banner with E. Pluribus Unum. Then a section of a white etched branch of oak leafs. There is gold gilt over blue niter foliage above and then bluing to finish. This 190 year old blade is in excellent condition with only some minor areas of discoloration to point. The washer appears to be original. On the reverse ricasso, first a long ornate vine with leafs and a flower. Then a silver etched area with etched cannon barrel and wheel with a spear to right and what may be a flag to left. In the next niter blue section a design featuring leaves then the face of an American Eastern Seaboard Indian that is wearing a feathered headdress. Then an etched silver section and then a gold gilt over a niter blue leaf design, and then more bluing to ending in swirls. THE SCABBARD: Is silver finished brass with 3 suspension rings and a trimmed drag.There are only traces of the original silver wash remaining. Both sides are without dents. There is a tiny vertical crack just below the throat, and light scratches and handling marks overall. PROVENANCE: Purchased at auction without provenance. OUR UNCONDITIONAL NO NONSENSE GUARANTEE: If not completely satisfied with your purchase it may be returned within three days of receipt in its original packaging if without damage. Return items must be insured for their full value. Only a prior email authorization from us for the return is required. Shipping charges are included in this offer if an error is due to our fault. International buyers welcome, but you are responsible for knowing the import laws of your country. We have satisfied customers in Argentina, Australia, Austria, Belgium, Bermuda, British Virgin Islands, Canada, Chile, China, Czech Republic, Democratic Republic of Congo, Denmark, Estonia, England, France, Germany, Greece, Holland, Hong Kong, Hungary, Iceland, Ireland, Israel, Italy, Japan, Kuwait, Latvia, Malaysia, Martinique, Mexico, New Zealand, Norway, Nova Scotia, Panama, Philippines, Poland, Portugal, Puerto Rico, Romania, Russia, Saudi Arabia, Scotland, Singapore, South Africa, Spain, St. Maarten, Sweden, Switzerland, Thailand, Turkey, United Arab Emirates, USVI and the Eastern Caribbean. Copyright 2013 -2011 by Land And Sea Collection. All Rights Reserved.